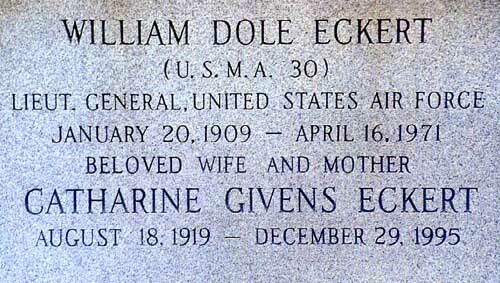 William Dole Eckert was born in Freeport, Illinois, in 1909. He enlisted in the Indiana National Guard in 1924 and in July 1926 entered the U.S. Military Academy. He graduated four years later and was appointed a second lieutenant of Field Artillery in the Regular Army. in October 1931. Two months later he transferred to the Air Force and was assigned at Selfridge Field, Mich., for duty with the 36th Pursuit Squadron. General Eckert, in April 1935, joined the 29th Pursuit Squadron at Albrook Field, Panama Canal Zone. In May 1937 he was named a flying instructor at the Air Corps Primary Flying School at Randolph Field, Texas. In September 1938 he entered Harvard University and in June 1940 graduated with a master's degree from the university's Graduate School of Business Administration. He then was assigned to Wright Field, Ohio where he served successively as production executive, comptroller, and as executive of the Materiel Command. 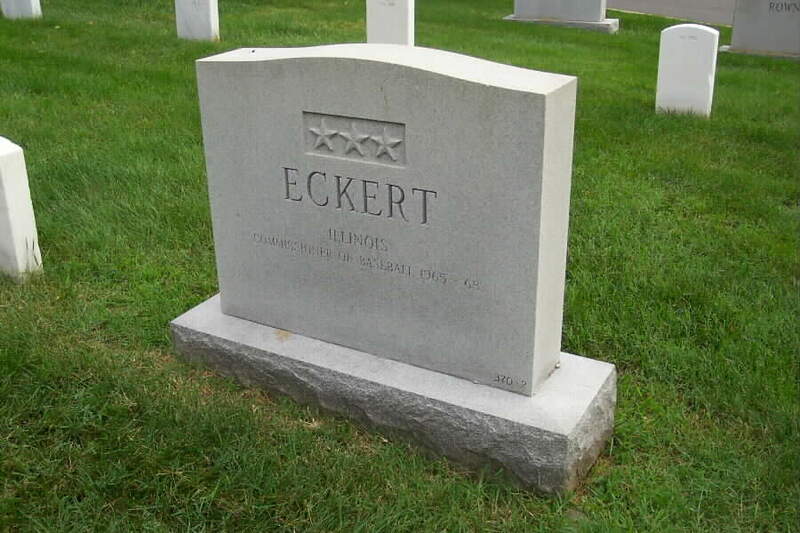 In January 1944 General Eckert entered the Army and Navy Staff College. Upon graduation two months later he was assigned to Europe as commander of the 452nd Bomb Group. He later served in that theater as chief of maintenance and chief of supply of the Ninth Air Force Service Command. 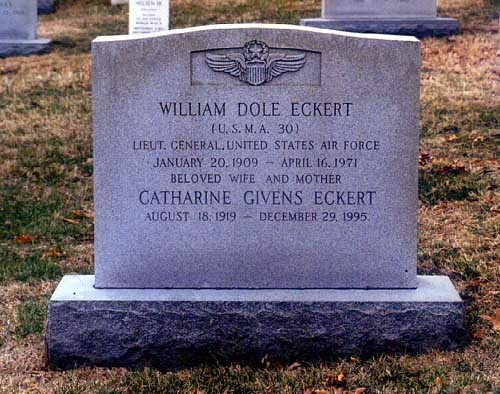 General Eckert was assigned, in July 1945, as executive in the Office of the Assistant Chief of Staff for Materiel at Air Force headquarters, and later was appointed chief of the Readjustment and Procurement Division of that office. In November 1947 he was assigned to the Office of the Secretary of the Air Force and two months later became executive to the undersecretary of the Air Force. In April 1949 General Eckert became comptroller of Air Materiel Command at Wright-Patterson Air Force Base, Ohio, and in October 1951 assumed additional duty as deputy commander of the Air Materiel Command. General Eckert was transferred to Air Force headquarters in June 1952 for duty as assistant deputy chief of staff for materiel. Relieved of this assignment he reported to Tactical Air Command, Langley Air Force Base, Virginia, July 15, 1956 to assume the duties of deputy commander (redesignated vice commander Nov. 5., 1956). 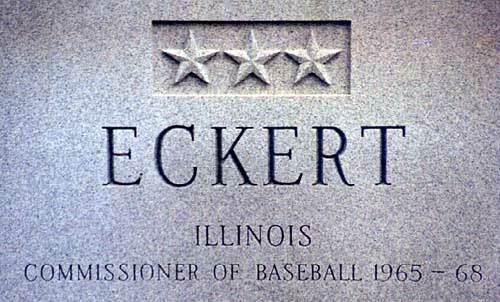 In February 1960 General Eckert was assigned to Headquarters U.S. Air Force for duty as the comptroller of the Air Force, effective February 1, 1960. His decorations include the Distinguished Service Medal, Legion of Merit with two oak leaf clusters, Distinguished Flying Cross, Bronze Star Medal, Air Medal, and foreign medals. He is rated a command pilot and technical observer. He was promoted to first lieutenant (temporary) May 8, 1935; to first lieutenant (Permanent) Aug. 1, 1935; to captain (permanent) June 12, 1940; to major (temporary) July 15, 1941; to lieutenant colonel (temporary) Jan. 5., 1942; to colonel (temporary) Aug. 1, 1944; to major (permanent) June 12, 1947; to colonel (permanent) April 2, 1948; to brigadier general (temporary) April 14, 1948; to major general (temporary) July 28, 1951; to brigadier general (permanent) July 21, 1952; to major general (permanent) Dec. 13, 1955; to lieutenant general (temporary) Aug. 31., 1957. 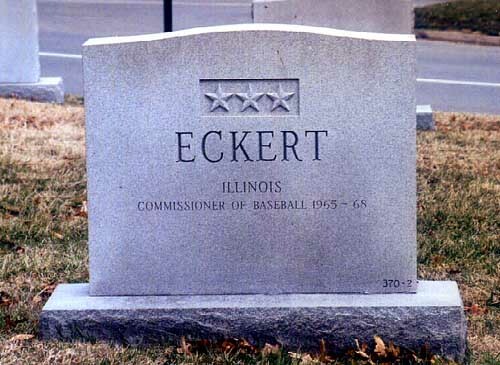 William D. Eckert served as Commissioner of Baseball from 1965 to 1968. The General was buried in Section 30 of Arlington National Cemetery. 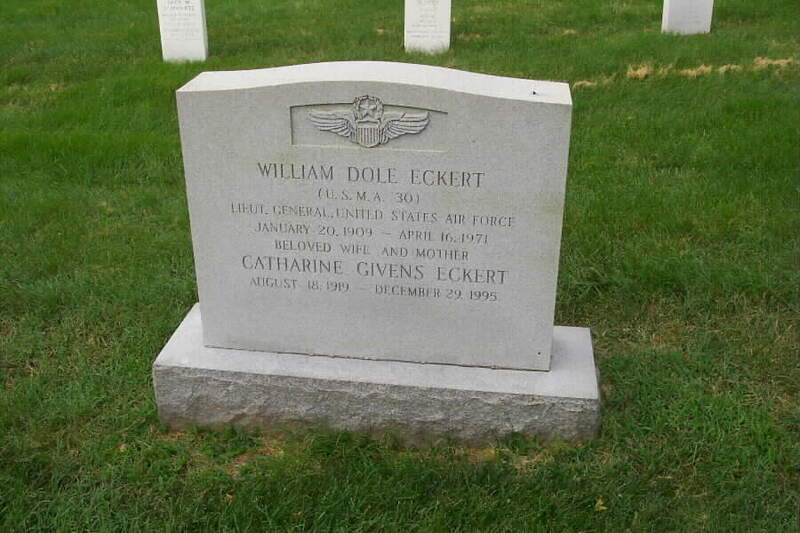 His wife, Catharine Givens Eckert (18 August 1919-29 December 1995) is buried with him.